Our 2 colour stock identity slider provides instant visual confirmation of level of stock for items in boxes or crates on racking and shelving. Tags: stock Indentity slider, Stock level indicator, 2 colour stock level slider. 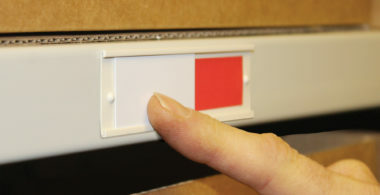 Our 2 colour stock indicator slider has a permanent aggresive adhesive fixing and couldn’t be simplier to use. Helps to instantly show where products are running low without the need to view inside boxes. The White slider can be written on or affix a label with product skus or stock locations to help identify the stored product.